This is a “Walter Gropius, Rational Building Construction” poster by Ernst Keller for two exhibitions at the zurich Kunstgewerbemuseum in 1931. 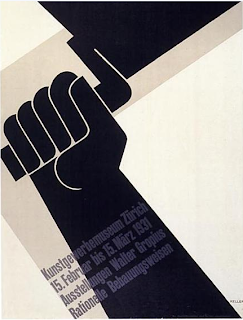 In this poster, Ernst Keller, one of the greatest Swiss Poster designers of his time, uses the diagonal to attract the eye and to suggest dynamic activity. This was a common strategy by this time, but Ernst Keller’s poster is entirely original and genius in its control of space, masterly drawing and integrating the text. “The printing of the image is by letterpress from linocut blocks overprinted from type in opaque grey.” The fingers gripping the handle of the trowel turn the hand into a fist, a universal symbol in political propaganda to suggest the acclamation and solidarity of a crowd.